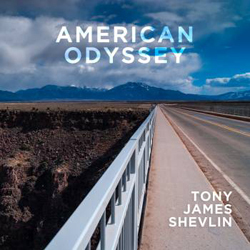 Well-respected Anglo-Irish songwriter Tony James Shevlin spent several months on the road in the US back in 2015 covering 17 States and 11,000 miles, notebook in hand. American Odyssey is his tour diary translated into song, name checking iconic cities and their associated local heroes. Think of a place and he’s been there and think of a rootsy American musical style and he probably has a go at it here. Recorded back home in Suffolk, American Odyssey is one of those albums that strains to capture an authentic American sound but at heart it remains a sonic postcard, a visitor writing home about the sights and sounds they’ve seen. But then again that’s been the case for aeons going back to Brinsley Schwartz and while Nick Lowe matured into a natural there’s oft been a curious reserve around some Anglo based Americana. Having said that Shevlin hits the button on several occasions with his Santa Fe Sadness a wonderful Tennessee type waltz while Ride The Mississippi is a very fine example of gusha gusha gumbo as cooked up years ago by Danny Adler. The album’s single, Travelling Man, is a breezy ride of a song lifted by its pedal steel and soaring refrain and there’s some Rockpile like rambunctiousness on When Ginny Gets Her Wings while Mockingbird benefits from the female harmonies surrounding Shevlin’s voice over some fine guitars and mandolin. While the remainder of the songs are all well worth a listen there’s a sense of something lacking as on the closing song, Robert Johnson’s Tears, which starts well but then is delivered a touch too stridently.